Marvelman appeared in Warrior #1-21; Quality Communications, 1982-4. #25-6 contained the letters from Marvel demanding Quality cease publishing Marvelman. The series would start from the beginning as Miracleman, reprinted in color by Eclipse Comics, continuing the story once the first six or seven issues wrapped up the revised reprints. 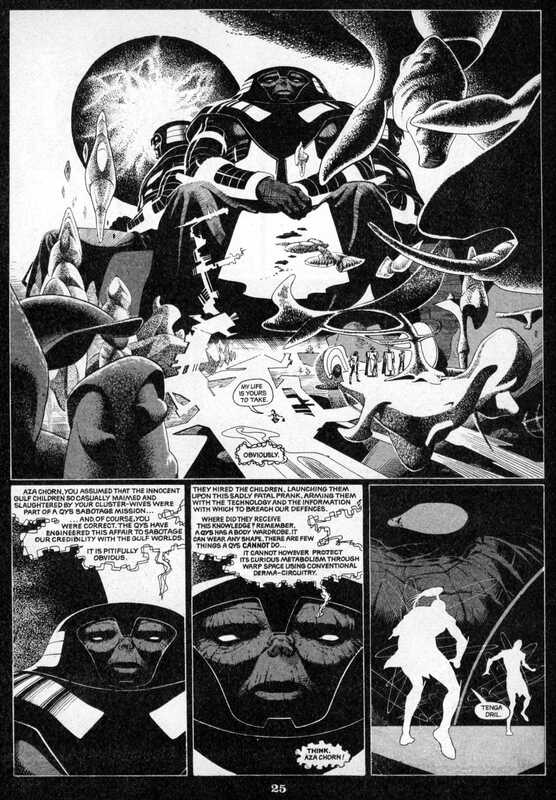 Script: Alan Moore; Art: Gary Leach, Alan Davis, etc. Marvelman appeared in Warrior #1-21; Quality Communications, 1982-4. #25-6 contained the letters from Marvel demanding Quality cease publishing Marvelman. The series would start from the beginning as Miracleman, reprinted in color by Eclipse Comics, continuing the story once the first six or seven issues wrapped up the revised reprints. Script: Alan Moore; Art: Gary Leach, Alan Davis, etc. Alan Moore’s WarpSmith: Cold War, Cold Warrior! Miracleman fans recognize Aza Chorn, the Warpsmith. He gave Miracleman a hand more than once, especially during the devastation of London. But if you never read the original issues of Warrior published in the UK by Quality, you missed this little gem: a two-part Warpsmith story by Miracleman team Alan Moore and Gary Leach. Yes, this story hit the streets in 1983 when Miracleman was still Marvelman. He adventured in black and white. Marvel Comics had not yet sent Quality a nasty-gram to cease and desist. At the same time, Warrior’s brief 26 issues also serialized the beginning of Alan Moore’s V For Vendetta. Along with several other interesting and artistic stories, Warrior packed a lot of heavy comics! But for now, let’s can the exposition and warp right into our gallery. Enjoy! – From Warrior #9-#10; Quality Communications, 1983. Script: Alan Moore; Art: Gary Leach.